Designed to complement the 300B power amplifier and the new KT88 amplifier - this all new pre-amplifier includes many new ideas and features, yet builds on CR's great experience in tube design. The pre-amplifier is constructed on printed circuit boards to ensure a reliable and consistent product with minimal variations from one unit to another. The main PCB contains the phono input and equalisation, line level pre-amplifier and output stages. The line level pre-amplifier stages are arranged on the double-sided PCB in a dual mono configuration to minimise cross-talk wherever possible. 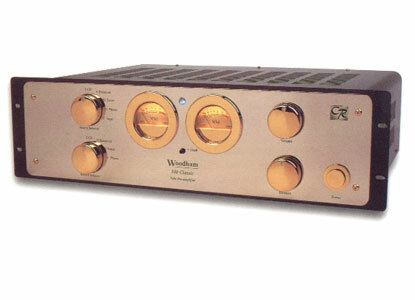 For the phono input, 3 triodes are used per channel for gain and equalisation. Accurate R1AA equalisation is achieved using some negative feedback, and close tolerance polypropylene capacitors carefully selected for this sensitive part of the pre-amplifier. This is a 2-box design with an external power supply unit, housed in a small matching metal box. The illuminated VU meters complete a combination of retro and professional style. A separate tube stage ensures there is no interference with audio signals.